At Aptsys, we go the extra mile to be far-sighted thinkers that devise great hawker solutions for potential inefficiencies in erratic hawker settings. Our hawker solutions are specially designed to alleviate chaotic hawker situations. Our Self-service Kiosk – Turquoise, is fully integrated with our POS and Mobile Application which works together hand-in-hand to bring out about the most optimum working system for hawker centres. Wireless ordering via mobile app, fully integrated with our powerful POS and Kiosk. Attracts & retains more customers & increases the repeat customer percentage, from push notifications. Cardless system reduces cost of printing, processing & postage expenses. No more plastic membership cards & stack of forms. Send messages to your customer to keep them in the loop on upcoming events, special offers & promotions. Preset a marketing schedule to send SMS or Email to targeted members in order to build a stronger relationship with them. Ready to experience a free demo? 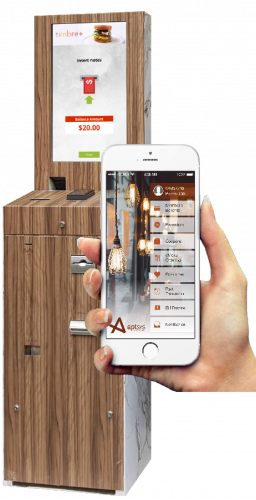 Aptsys is in the business of using simple, smart, connected softwares, devices and payment gateways to help F&B owners to improve guests experience and retention, generate additional revenue, improve accuracies of orders, increases the speed of payment collections and reduces wastage as well as better deployment of labour and resources.